Once upon a time, there was a little reactionary that had to realise that his Empire was crumbling and that his people were increasingly aware of their own power. Reluctantly, he started to grant citizen rights and allowed an increasing amount of representation. "Once upon a time" was in the second half of the 19th century and the little reactionary was the aging Emperor Franz Joseph I, who had spent the first three years cutting down all the civil rights that had been granted in the year of the revolution in 1848. By the early 1860ies, liberalism and nationalism had spread all over his Empire and particularly the Hungarians insisted on independence from Vienna. Legal representation became a pressing desire and eventually Franz Joseph agreed on some very basic privileges for the seventeen peoples of his Empire. And so the Austrians built their first Houses of Parliament: Started in 1861, a provisory building was erected by the architect Ferdinand Fellner. Within a mere six weeks, the building was finished in the district of Währing - nightshifts worked with torches for lighting, and a total of approximately 1,000 people was involved with the construction works. 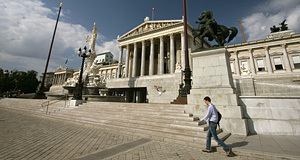 The basic structure of the building resembled the one of the current, new Houses of Parliament and the initial meetings were chaired by Anton von Schmerling. The Viennese soon referred to the building as the "Schmerlingtheatre", proving that they were quick with learning the basic rules of democracy ("Thou shalt make fun of your government"). The Schmerlingtheatre served as a provisory solution until the current Houses of Parliament were ready in 1884. This proper edifice was designed by Theophil Hansen, who was Danish and a highly popular architect of the late 19th century (he also designed the Academy of Fine Arts and other representative buildings on the Ringstraße). The first impression you might get from the building is that it is not very big. Step back a little and you will realise that you are wrong: Since the parliament has the outlay of a Greek temple, most of the building disappears behind the odd array of pillars. In front of the building is a huge statue of Pallas Athena, the goddess of wisdom. The original design had intended to have an "Austria", a female allegory of the Austrian nation, but this was opposed by Hungarian nationalists. So they finally came up with the goddess of wisdom that was built between 1893 and 1902, but didn't have too much of an effect on the people working inside. The fountain that Athena is part of was designed by Carl Kundmann and also includes allegories of the four most important rivers of the empire: Moldau, Danube, Inn and Elbe. On the mantelpiece/pediment above the main entrance, you can see allegories of the 17 nations of the empire and Emperor Franz Joseph I grumpily giving out civil rights. There are all kinds of statues and decorations on the building, including chariots and lots of heavy symbols, but nothing overly spectacular. The whole building has many features in common with a Las Vegas Casino in kind-of-antique-like-you-know, reflecting the fine taste of architecture that high ranking decision makers of Austria had in the 19th century. The ramp leading to the main entrance was the site where the First Republic of Austria was announced in 1918 (some 200 metres further up the road, at the Heldenplatz Square, is the site where it was finally abolished by Adolf Hitler in 1938 - both occasions involved cheering crowds). If you want to see some of the overloaded interiors that are even more neo-Classical than the outside, you can get a free ticket for a guided tour in German. Alternatively, you could also join a parliamentary discussion, something that I have never done and don't really fancy doing - Austrian debates are not as entertaining as British ones and so I was spoilt by the BBC and all the "hear, hears" from London. A tour is recommendable, though; if you attend one and see the interiors, think of Queen Amidala's palace in "Star Wars" - the style is very similar. Tours do not take place during parliamentary debates.